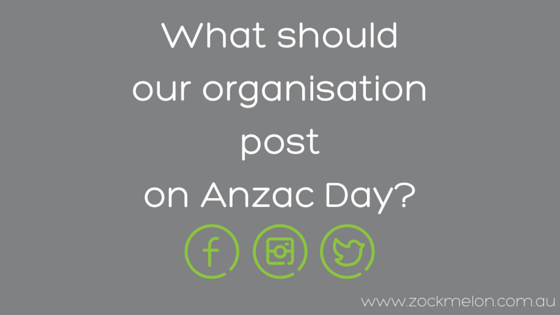 Anzac Day Social Media – What should our organisation post? Home → Social media → Anzac Day Social Media – What should our organisation post? Are Anzac Day social media fails ‘Fresh in your Memories’? If you are reading our humble little blog, there’s a good chance you are not part of an Australian supermarket duopoly. Rather you are most likely a health or community-based service, small Government agency or other NGO. If your organisation is nervous or unsure about what to post on social media on Anzac day there is a good reason. Social media posting sans strategy (AKA posting content willy-nilly) is a big risk. Let’s talk about the pros and cons of putting out Anzac Day content on your organisation’s social platforms. First of all, an obvious ‘pro’. Anzac day posts are sent, by definition, on the Anzac Day public holiday. A time when many Australians are off work for the day and spending time with their loved ones mobile devices. It’s a good chance to be seen. On the flip side, your picture of a poppy will be one of many in a follower’s news feed. Does it really stand out? Does it really add anything to the user? 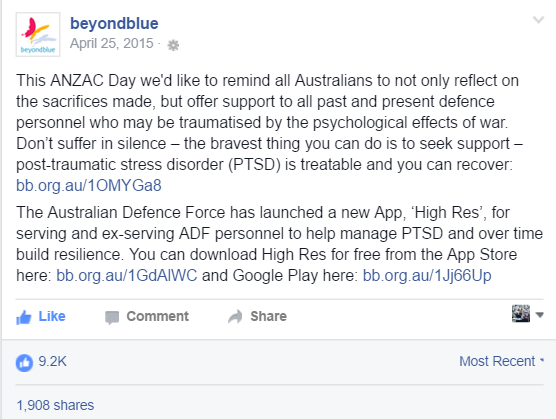 An example of an appropriate Anzac Day post from Beyond Blue which shares information about a new app for PTSD launched by the Australian Defence Force. Please consider whether your post will actually serve a purpose to the reader, or is it just about adding a little nationalistic shine to your organisation’s halo? If your post serves your organisation or brand more than it does the reader, then it’s not suitable for Anzac Day. If you are a geographically based service, post something thanking the service women and men of your area, or remind people of local Anzac services. Share a staff member’s prized Anzac biscuit recipe. Post on the days preceding Anzac Day itself. Remind people of your open hours over the long weekend (simple, and helpful) and you can add your own words or recognitions of the day to this also. Post with helpful services over the long weekend, such as crisis phone numbers or other relevant helplines or partner agencies. As always, be careful not to just ‘take’ images from a Google Image search. At the very least use a Creative Commons licensed image through Flickr and correctly attributed. If you are posting, before you do so, please take the time to read and be guided by this very helpful RSL Style Guide. Interestingly the RSL Style Guide recommends following relevant social media pages yourself for months prior to Anzac Day to get a feel for the comments and sentiment of followers of those pages. It’s not just about knowing your community when you post about an issue that might pertain to those outside of your immediate follower base. Remember, there are 364 other days of the year so you still have ample opportunity to connect with your audience to show what your organisation stands for and cares about. Above all else, your social media strategy and the content you put out in the world should reflect the values and brand of your program or organisation. If it feels inauthentic, contrived, or just plain icky, then you should probably shouldn’t post.